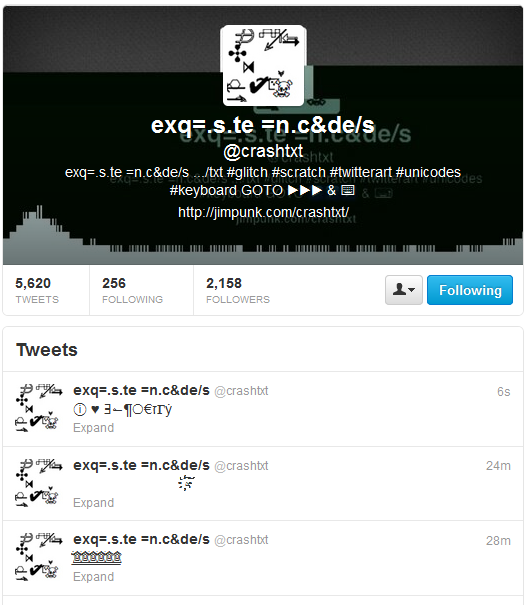 This work consists of a web page with a selected unicode keyboard that allows people to enter symbols into a text submission box which can then be posted to Twitter under the @crashtxt account. Jim Punk is an alias for an anonymous net artist whose work embodies glitch aesthetics and pictorial uses of language and characters, as seen in ascii art. To be precise, this work is a tool for unicode art, strapped on to a social network as a mode for publication, but also as a constraint. It is also an invitation for errors, since compatibility and support for certain Unicode characters vary on different operating systems and browsers. To use this work to write texts for publication in Twitter is to engage a basic component for digital communication: the encoding of writing and its associated symbols in computational environments, which aligns it with some of the goals of Lettrism. I invite you to explore, write, draw with this tool considering what can be written with this online keyboard, which might seem alien compared to a QWERTY keyboard but represents very human needs for symbolic communication beyond the most common 107 (or so) characters.